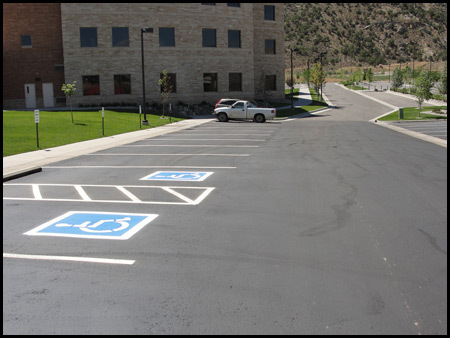 Why sealcoating parking lot is important? First, the surface of the lot will be cleaned of dirt, dust and debris. Next, the oil and grease spots will be cleaned and primed. Finally, a two coat application using either one of the following products will be applied. Sand is added at 1.5 lbs per gallon of water to both the Protector Blend Ultra Sealer and the Ultra Seal. Sand is added to the sealer for durability and partical suspension. Weather temperature needs to be at least 50 degrees during and for at least 8 hours after application. 24 hours of dry time is needed to allow proper curing. If need be, we can sealcoat in sections to minimize impact on traffic. Sprinklers need to be turned off for a minimum of 48 hours after application.